It’s sink or swim time – will your team come out high and dry, or end up all wet? Your vessel must be capable of transporting several team members and your team flag. Navigate through an obstacle course to a dock or buoy on a body of water (we’ve used lakes, pools, rivers and even the ocean), then (hopefully) all the way back to shore. All members of your crew must coordinate efforts to brainstorm, create and build the raft. Here’s your chance to be Huckleberry Finn, except that in our version everyone wears a lifejacket! The Return of the Titanic Boat Build team building program is perfect summer time fun, and even better if you’re heading to Florida or further south for your January conference! There are roles for everyone, so everyone is engaged at the level that works best for them. Teams gather points for innovative ideas, involving everyone on the team, creating the most beautiful flag, collaborating with other teams, and designing the most beautiful boat to name a few. Not everyone needs to go into the water, only those that want to get wet. The photos and memories after the event are priceless and the fun and learning last much longer than a three hour tour, a three hour tour. An optional debrief by one of our consultants drives the learning home, and links building performance with team performance in the work place. Wherever you are in the spectrum between workplace links and pure fun, we’ll meet you there. Hopefully somewhat less than a three-hour tour. A body of water. 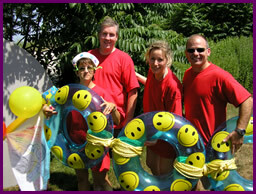 We come to you with everything you need to have a fun, safe and successful event!